CS Tree Services provides the latest in plant health care services. From diagnosis to treatment, our Certified Arborists can identify what ails your tree and provide the solution. The most common problem for trees is an affected root system. Whether it is from construction, compaction, poor soil, or a host of other reasons, many times these root problems can be fixed. It is hard for people to remember that there is just as much tree underground, as there is above ground, and these roots are equally important to the trees well-being. 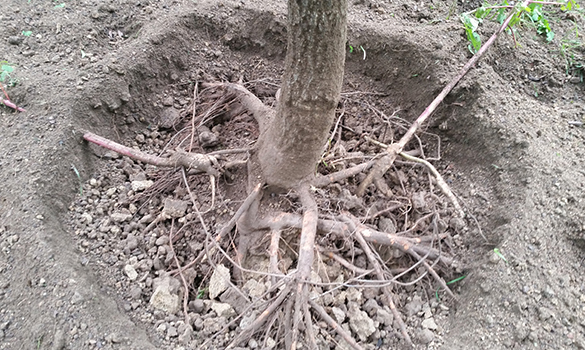 Deep root fertilization consists of many different techniques. Fertilization can be achieved through basal soil drenches, micro-injections, bark painting, etc. CS Tree Services provides radial trenching as another means of rejuvenating poor soils in the root zones of trees. Radial trenching is achieved through the use of a high-pressure air spade. The air spade will blow existing soil away from roots, without damaging them. Typically, soil is removed in trench lines, radiating out from the truck of the tree, hence the name, radial trenching. Trench lines are then filled with a rich organic material (i.e. compost & mulch). This organic material is then slowly incorporated into the soil. This helps provide soil aeration to allow more oxygen and water to be available in the soil for the roots. It also provides food for many beneficial organisms, as well as good food for the tree roots. Usually the critical root zone area of the tree is then covered with a nice layer of mulch, to help with temperature regulation, moisture content, and continued incorporation of organic material into the soil for the roots. Many times, though, radial trenching is done under a layer of sod, which is then replaced on top of the amended soil trenches. Radial trenching is also very useful for installing water lines, electrical, lines, cable lines, etc. that need to pass through the root zone of a tree. A trench can be excavated through the root zone, without damaging the roots, and then utilities can be laid under or through the root zone. This is a much better option to critically injuring a tree's roots and perhaps causing structural damage that could lead to a tree falling over or dying. Remember, a trench laid relatively close to a tree can sever almost half of a tree's roots. CS Tree Services provides vertical mulching services to help encourage healthy roots in your trees. Vertical mulching can achieve several goals for the roots of your tree. It helps aerate the soil where the roots are. This creates more space in the soil for oxygen and water, the two most important elements for healthy root production. Compaction is one of the most common problems for roots, leading to anaerobic activity in the soil, as well as leaving very little room for water, which is vital to a trees healthy growth. Vertical mulching also helps add organic material into the soil around the root system. Organic material breakdown into the soil, providing more aeration, food for beneficial micro-organisms and organic compounds important to the trees nutritional needs. The process for vertical mulching is fairly easy on trees. Holes are created in a grid-like pattern throughout the root zone of an affected tree. These holes are then filled with organic material (i.e. rich composts and mulch) and the entire area given a fresh layer of mulch.